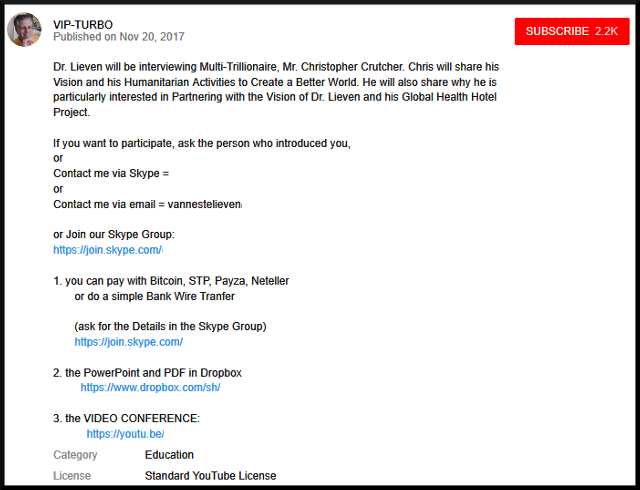 Poor Dr. Lieven had been regulated to pimping little Ponzi's here and there in Europe, but now he has hit the mother lode. This has got to be the most ridiculous Ponzi ever, and anyone believing this BS deserves to lose their money. He announced in his YouTube video he is heading a $22 Billion Health Hotel Project. But his partner is just not some little penny-ante contributor, but as he announced Christopher Crutcher is a "TRILLIONAIRE." Yep you read that correctly. And he even has an AB Degree from Harvard in European History to back up his credentials. Never mind that there are ZERO, NIL, NADA, ZILCH, NONE Trillionaires anywhere in the world, if Dr Lieven says he is then by God he's a Trillionaire. WARNING! DO NOT DRINK ANYTHING WHEN WATCHING THIS VIDEO OR YOU WILL RUIN YOUR MONITOR AND KEYBOARD, OR YOU MAY CHOKE TO DEATH WHEN DRINKING AND WATCHING. As you say, anyone who believes this pile of steaming horse puckey deserves to lose their money. Even the serial ponzi players on the usual suspect HYIP ponzi forums will be choking on their Cornflakes when they watch. Can't even bring yourself to take one for the team ??? EagleOne, shipdit and Bestbud like this. Not even with a load of Vegemite!!! littleroundman, EagleOne and shipdit like this.